An experienced, award winning and highly talented television executive. Graeme is the Chief Operating Officer for GOD TV, a global Christian television network. Graeme is an experienced producer and director with over 25 years in the industry. He is committed to the production of strong, creative, informative and entertaining programming. Skilled in all aspects of television programme production, including both single and multi-camera output, and possessing an in depth knowledge of both production and operations he is also experienced in leading creative teams and has pioneered in the field of Christian Television. He has produced content in many countries around the world and understands how to produce great television on both a limited budget and in difficult circumstances. 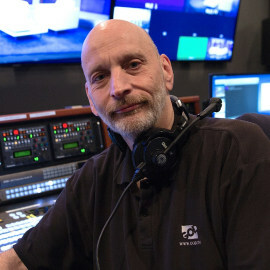 Now leading the Network’s operations, his responsibilities include distribution, playout, rights and compliance as well as oversight of all the network’s productions. Originally from the UK, Graeme now lives with his wife Janice and son Stephen in Redding, Northern California.